I recently posted this adorable snack on my Facebook page and was inspired to create a similar snack but more for a Valentines Day Snack Idea. 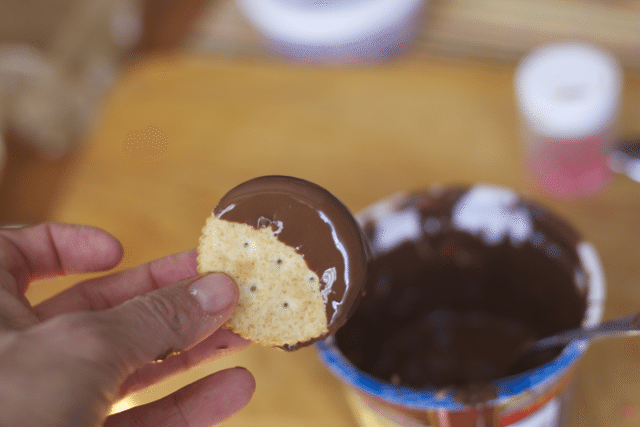 I know peanuts are not allowed in most schools now, but maybe your child’s classroom does not have any allergies and you can make a bunch of these Irresistibly Good Chocolate Covered Ritz Cracker Sandwiches very quickly and they are better than candy. 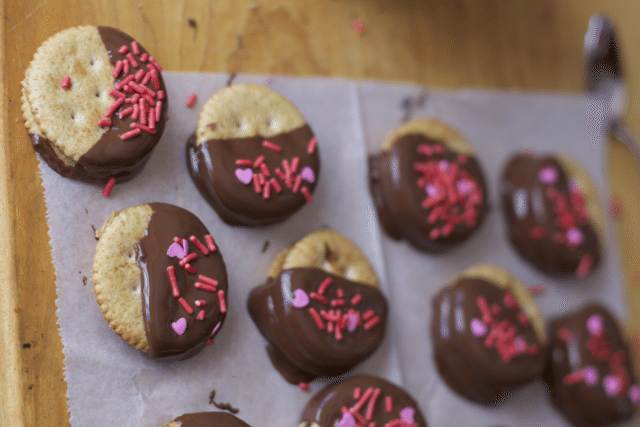 The original crackers I saw had only peanut butter but since chocolate is such a big part of Valentine’s Day we added Nutella in some of them. This could not be an easier Valentines Day Snack Idea and you can add any sort of Nut Butter or Chocolate spread your family enjoys. 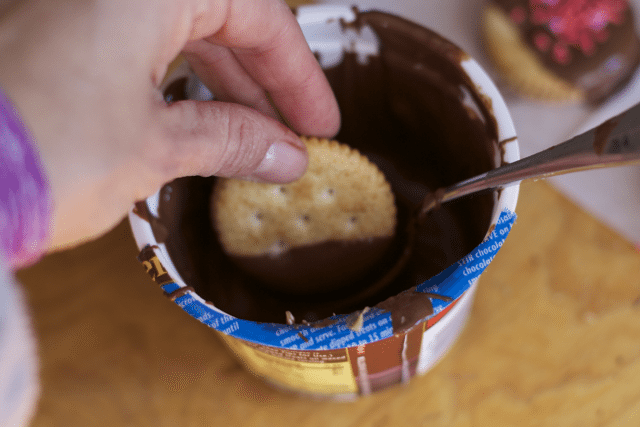 Place another cracker on top and dip into melted chocolate. (I prefer the chocolate discs that come in the container so much easier but a little more expensive) Be sure to follow these directions on how to melt chocolate correctly. Allow any excess chocolate to drip off to make a smooth looking surface. You can also cover the entire cracker sandwich in the chocolate. Its up to you. Since it was cold outside, I just placed the tray outside and allowed the chocolate to harden. 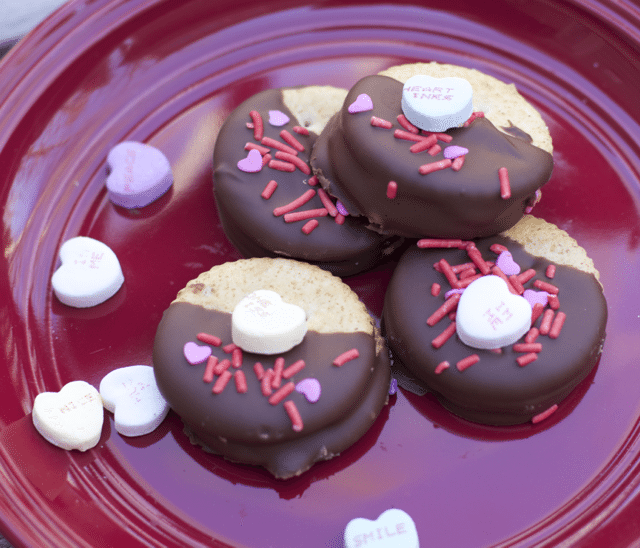 Then serve theses Chocolate Covered Crackers to your favorite Valentines. I guarantee these Chocolate Covered Cracker Sandwiches are one snack that will not last in your house. Even my husband was caught eating a few. 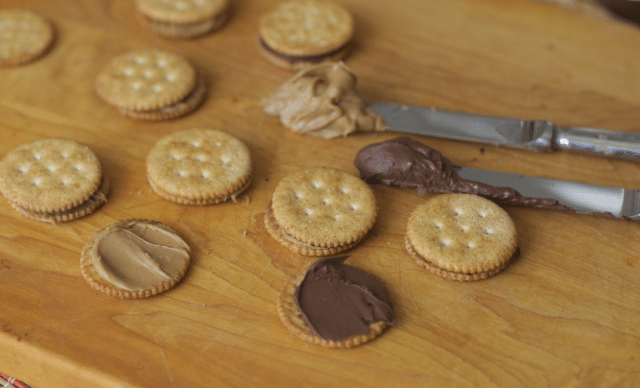 What flavor spread would you use in these Chocolate Covered Ritz Cracker Sandwiches?